TCLS Mortgage Processing Center of America, Inc. is looking for a JUNIOR ACCOUNTANT. The successful applicant will be assigned at their office in Shaw Blvd., Mandaluyong City. Starting salary is above minimum wage so we are encouraging you to apply for the position. Preferably 5 Yrs of working experience in the related field is required for this position.. Candidate must possess at least a Bachelor's/College Degree , Finance/Accountancy/Banking or equivalent. 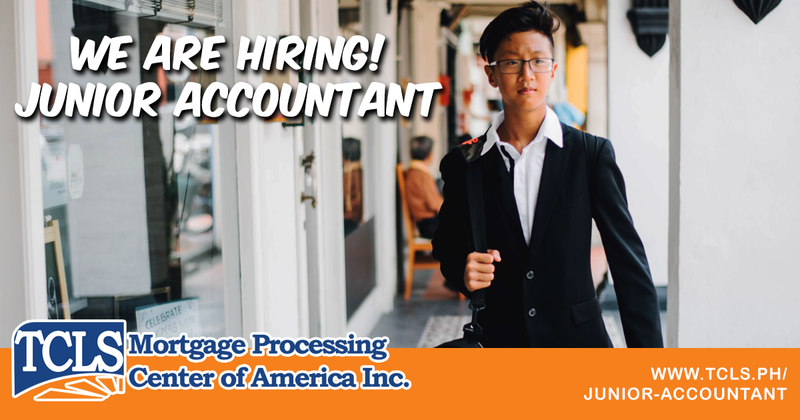 Required skill(s): financial research and analysis, excellent communication skills, fluent in English, proficiency in accounting software common to the mortgage industry, Professional experience in general accounting, MS Office. Supports all accounting functions in payroll, accounts payable, accounts receivable, and bank reconciliation. Applicants must be willing to work in Shaw Boulevard. Preferably 5-8 year(s) Experienced Employees specializing in Finance - General/Cost Accounting or equivalent. Serves as a member of the team and contributes to the corporate administration team by performing additional administrative and office operations tasks as directed. Performs administrative functions including data entry, filing, processing new employee documents, and creating and updating relevant procedures. Provides HMAC compliant and other accounting practices support. Responsible for guiding, reporting, and ensuring compliance for company policies. Supports internal and external audits. Maintains the utmost discretion in the handling of sensitive payroll and corporate financial information. Understand and implement all company policies and guidelines. To apply visit the TCLS website link for this job.